Tips to help you find the right office phone system for your business. The telephone is the first port of call for customers and can often make or break a business relationship or transaction. It’s of vital importance in business that you get the foundations for your office phone system spot on. A good receptionist or telephone operator is an important feature for any office phone system. However, the phone system itself also plays a starring role in how well your establishment performs at the telecommunication greeting. 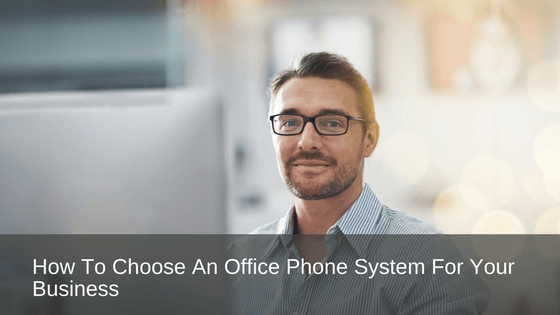 How do you choose an office phone system for your business and what phone system is best for you? Following are some different phone systems available, and the respective pros and cons of each. Traditional phone systems are landlines supported by a local or regional phone company. Traditional landlines are analogue systems which operate via conventional copper wiring. To make use of a landline service, you also need some on-premise PBX hardware. This hardware is used to set up various telephone extensions and enable some phone system features like transferring of calls and call directories. Some landline systems today are manufactured as a hybrid with VOIP telephone systems. This is when a traditional phone is run to connect a business’s data network. The data network set up is in turn employed to connect the individual phones within the business. Tried and tested phone systems that have been used successfully for many years. A lot of phone system providers are removing their landlines from their offerings, which makes them difficult to purchase as well as to repair in the event they should fail. Most applicable for: large businesses that have the budget to buy them and a staff of IT personnel or outsource to communication specialists who can operate and maintain them. Landline systems are necessary for businesses who do not have access to high-speed internet. VOIP telephone systems run off the same internet connection that is already set up for the business. A VOIP system can offer features for businesses that only large corporations using expensive hardware previously had access to. These enhanced features include automated call attendants, call queues and integration with computers. Computer integration allows voicemails to be forwarded to inboxes, while computers can be transformed into ‘softphones’ allowing you to make telephone calls from devices such as your desktop, laptop or tablet. VOIP telephone systems are sophisticated with technologies simple to access. The systems are easy to set up and are more cost effective than traditional landlines. A VOIP telephone system must have access to an internet connection. VOIP telephone systems provide the option to either purchase your equipment outright and self-host or rent the phone equipment from a service provider who will then house the system in the cloud. Most applicable for: any business that seeks the extra functionality of a sophisticated phone system, for a reasonable price. Any company where employees work remotely and you want them to gain access to the main phone system. All of the equipment that is required to run the phone system is purchased outright and housed within your business if you opt for an on-premises VOIP system. While you purchase all of the necessary hardware, you are also required to pay monthly fees for PRI circuit, or your SIP trunking, which enables calls to be made and received. Your business is responsible for handling the maintenance of the phone system, and any repairs or upgrades required. You, as the owner of the equipment, remain in control of your telephone service. It is your staff/team who keep it running and configured according to your preference. The cost at the onset is significant as you are required to buy all the equipment. You need to ensure you have someone on hand who can maintain the system at your end. Most applicable for: businesses that don’t as yet trust the cloud and prefer the control of their system and direct access to the equipment. Good for businesses with dedicated support partners who can configure and maintain the system. On-premises systems are better for businesses with regulatory or compliance obligations which could be problematic to meet in the cloud. There is no maintenance or hardware required, other than IP phones as the service provider houses all of the technology that is required to run the system. The cloud gives the easy option to add new lines when needed and offers speedy access to any new features. A monthly fee is usually paid on a basis per user. There is no requirement to purchase any hardware or maintenance of a cloud-based VOIP system. The system is configured by the convenience of a computer. As you do not have access to the hardware if the system crashes you need to rely on your service provider to rectify the problem. Most applicable for: expanding businesses who may be on a fixed budget and do not have staff who can operate PBX hardware. This system is also handy for businesses that need swift access to new phone system features, or are run from multiple locations and would prefer to operate a system from a single platform. So, now you have a simple overview of the pros and cons of VOIP telephone systems. You also have a fair understanding of the available choices in on-premises VOIP office phone systems and cloud-based VOIP office phone systems, in comparison to the regular landline phone systems we all know so well. Do you need to choose an office phone system for your business? Are you able to identify which office phone system is best for you? The ball is now in your court to make your decision based on budget, convenience and functionality. At Prosum, we are experts in communication and technology solutions, we provide office phone system recommendations and solutions to businesses of all sizes, across all industries, right around Australia. With 50 years of expertise, no one knows technology and communication like Prosum. If you would like more information or need help in deciding on the best office phone system for your business, contact us today for expert advice – call 1800 007 229 or visit www.prosum.com.au we’d love to hear from you.